It came!! It came!! My Socks That Rock in Moss Agate came!!! Here are some finished items! First, the 4-Hour Blanket made with size 50 needles and 4 strands of Homespun (I used Montana Sky, Coral Gables, Sunshine State and Florida Keys). 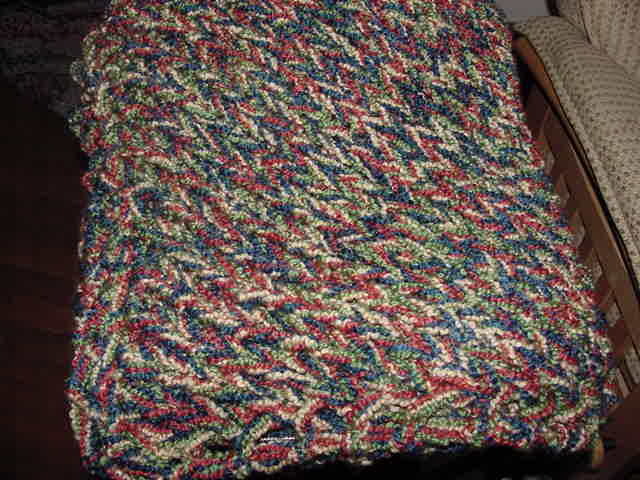 Here is the other Project Linus blanket. You can't tell here, but it's an awkward size. Really should have made it longer, but I was running out of time and energy, so it is what it is. It's still a nice size for a baby or toddler. You can't see the whole thing in this picture. 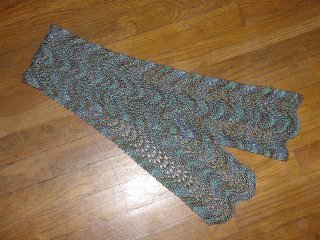 Mom's silk scarf is also finished, though I couldn't get a good picture of it. 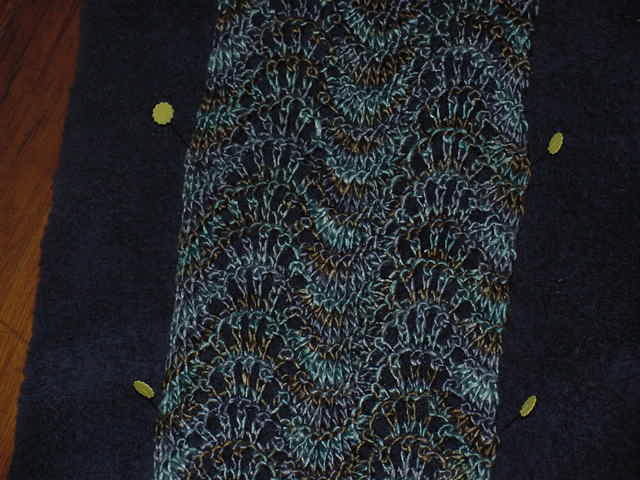 Here is a rather dark close-up of it while it was blocking - you can really see the feather & fan pattern. The scarf is short, but I think it will be fine. 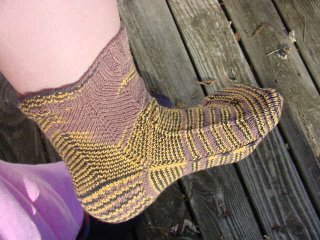 I wasn't sure how the silk would block, but I looked online to see how to do it and it came out great! 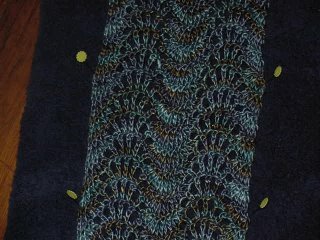 It's recommended to lay the silk item out on towels or a blocking board, pin it in the correct shape and then lightly mist it with water from a spray bottle. So that's what I did and it really did work well. Otherwise, the in-laws left yesterday, Natalie and Ethan still aren't 100%, but are feeling better, I got my Knitting Olympics yarn situation sorted out, got a ball winder and I'm still knitting. Man, it's been a week. Two weeks, actually. Last week Ethan had croup. Really not fun. This week, my in-laws are here and Natalie has been really sick. Really, really not fun. 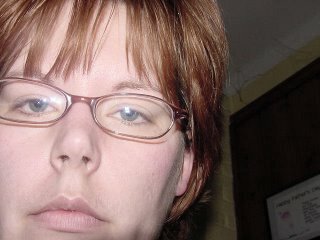 I haven't had this little sleep since college. Only difference was, back then I *chose* not to sleep. That willingness factor really changes your outlook, I've discovered. Thankfully, while Natalie and Ethan are not back to normal yet, they are definitely feeling better and on the road to recovery. The in-laws have been busy building Greg's office in the basement. It's going well, but will not be finished by the time they have to leave tomorrow. *sigh* Greg's dad is...shall we say...overly thorough. He does a good job. He insists on things being done the right way. Wonderful! Great! Unfortunately, the process takes F-O-R-E-V-E-R because he doesn't just measure twice, cut once...he measures 14 times, thinks about it, looks at all the options, measures some more and then finally cuts. Anyway, the drywall is almost all put up, so today he will be taping and mudding. 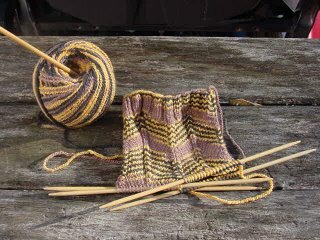 As you can see in my sidebar, I have joined Team Wales for the Knitting Olympics. You can click on the button over there for more info. I figure I can use the support. Speaking of the Knitting Olympics, my yarn has still not arrived. I am annoyed about this. So far, I've been told two different things by the shop I ordered from and if it doesn't arrive today, I'll be calling them again. The yarn was not in stock when I ordered, so I knew there would be some delay - but we are now at 2 weeks since I placed the order. I just want my yarn! 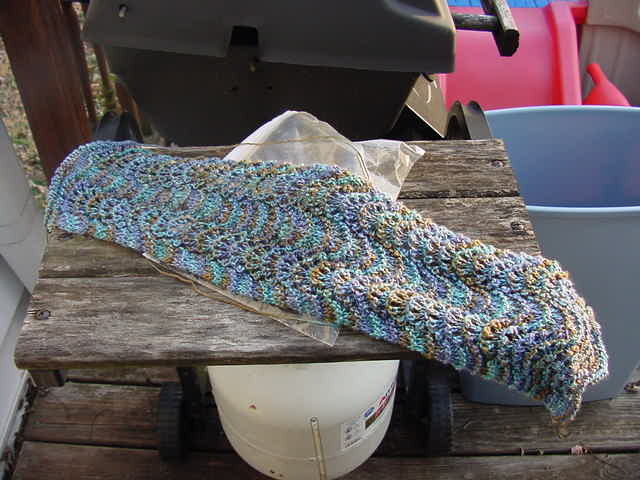 I have been knitting this week, in spite of the sick, needy children. No pictures today, though. Perhaps tomorrow. 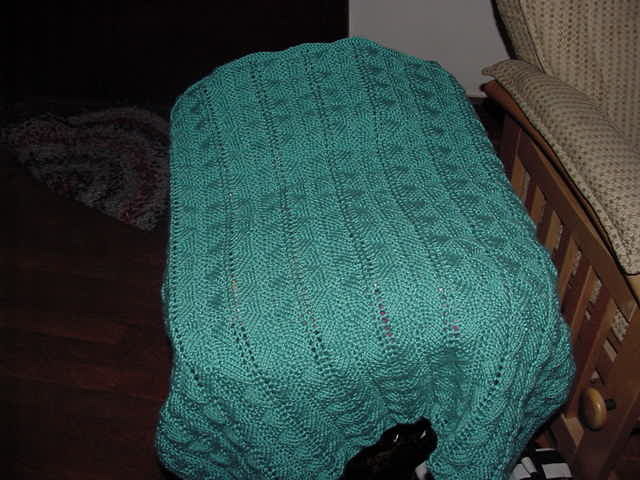 I finished the Project Linus blanket and am currently working on the second one, which goes much, MUCH faster. 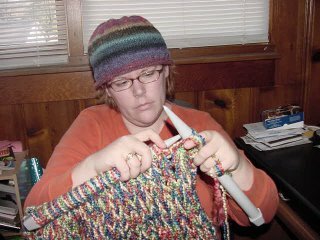 I also worked on learning to knit in the round with 2 circular needles. 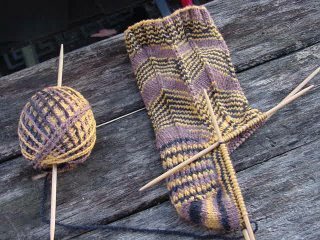 I cast on a simple ribbed sock, then frogged it. Then I cast on a Jaywalker with a picot edge TWICE, then frogged both attempts. I then cast on the toe of Elfine TWICE and have frogged both of those attempts, too. Not a good sock week, apparently. In my defense, it was really more about trying new techniques than it was about starting new socks, so the lack of progress doesn't bother me too much. For today's self portrait, I give you "Me in my Gamer." 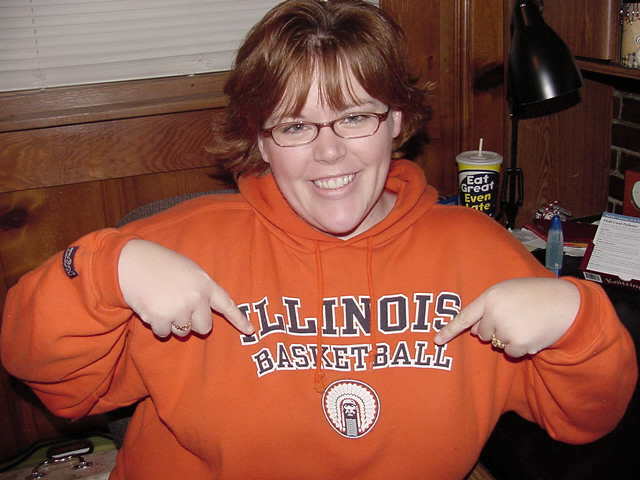 Today is not a game day, but my sweatshirt is warm and today, I am not. In other news, my in-law's are here for the week to help build Greg's office in the basement. I hope they are able to finish it. Sick, croupy toddler=very little crafty time. However, I was a little surprised to see that I really have made progress since last week. Do any of you hesitate before dipping into/squeezing/using the first of a new product? I opened a new jar of peanut butter today for Natalie's daily peanut butter sandwich and caught myself hesistating for a moment before I plunged the knife into the perfect smoothness just inside the jar. I hated to mess it up. And yet there is a part of me that would love to someday take a new tube of toothpaste and just squeeze to my heart's content, much like Ramona did in one of the Ramona the Pest books. I wonder what this says about me? Bible study starts back up tonight and I'm looking forwad to it. I'm eager to start this study (The Patriarchs by Beth Moore) and I'm also eager to have those few hours out of the house again. I love my kids with every fiber of my being, but gosh it's good to have a couple of hours to talk to other adults sometimes. My violin student starts back up again tonight, too. Gotta figure out how to balance things out so she won't get bored with our regular music, now that Christmas music is out of season. I'm pale from all the knitting. 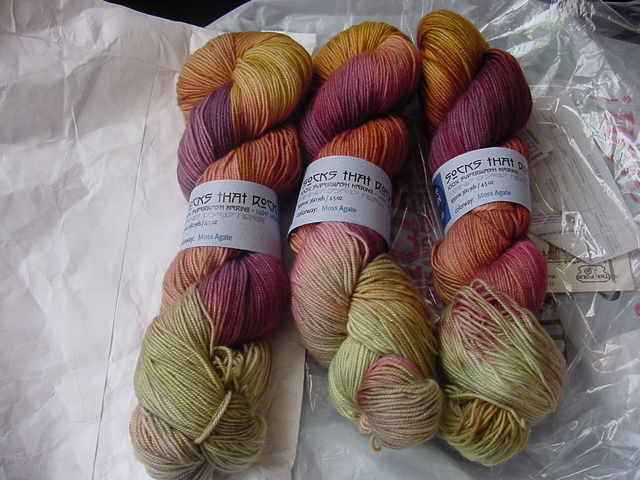 I received my first order of custom-dyed sock yarn this week. 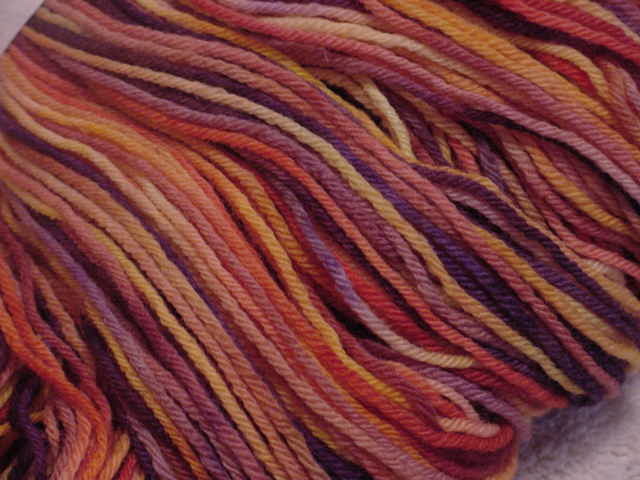 The colorway is Bombay, from TwoWaters Fiberworks. 100% merino. I love it. Time for a crafty update! 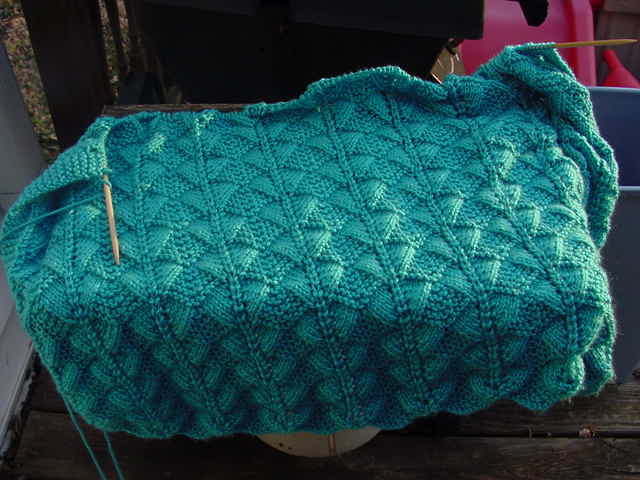 My Project Linus blanket is making good progress, but it is most definitely *slow*. I love the pattern. Think it's very cool. I just wish it went faster. 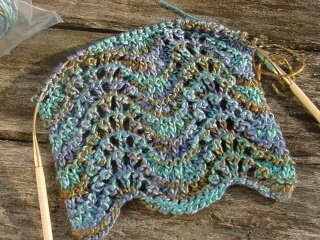 Yarn is Caron Simply Soft in Blue Mint. Size 7 needles. 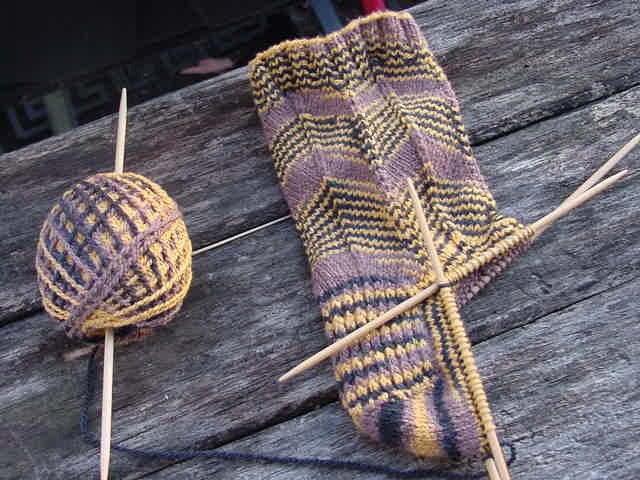 And finally, Cedric2 is getting a heel flap! I had to wear Cedric1 last night while I worked on this...just because I could. I'm so sick of the weather being totally different every day!! 30-something one day, 72 the next...how's a girl to know if it's a scarf day or not?? All is well in Jaywalker land! 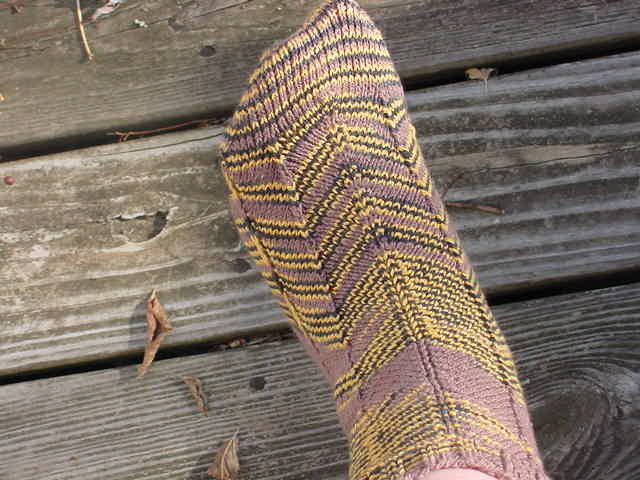 In case any of you missed it, these socks are named "Cedric." If you're an HP fan, you'll understand. If not, don't worry about it - just nod and smile and say "ok!" 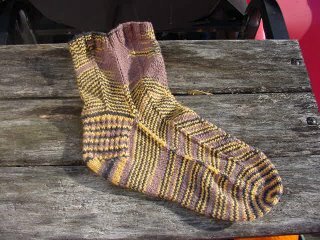 Anyway, I'm pleased to report that Cedric1 is finished and Cedric2 is on its way! As you can see, Cedric1 has some interesting pooling at the beginning, but I don't mind it. Just adds character. Time for a crafty report. 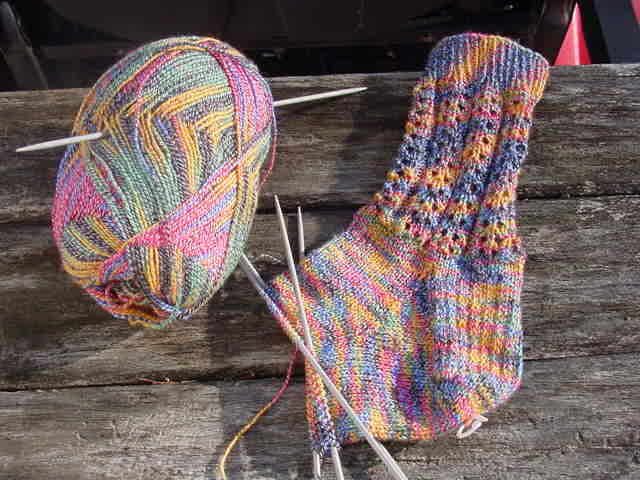 This is a new sock that I've started for my sister. 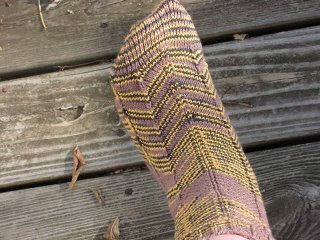 Pattern is "Panorama Socks" from the Knitting Pattern-a-Day Calendar. 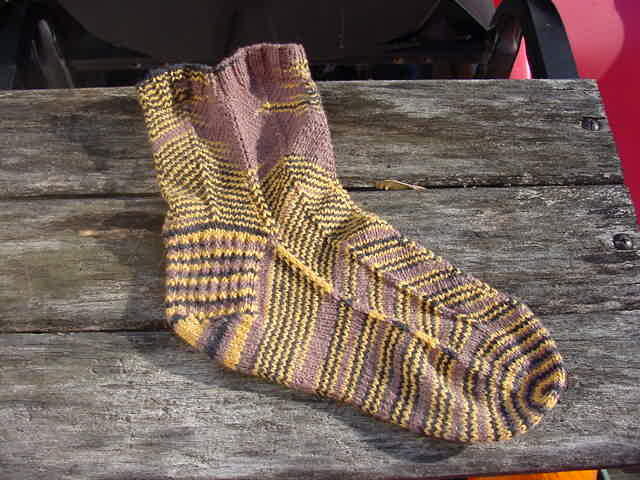 Yarn is Plymouth Sockotta. 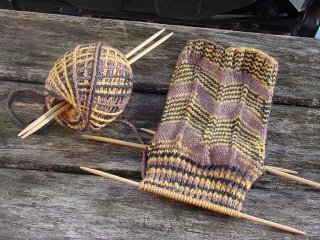 Size 2 needles. Here we have My So-Called Scarf in Manos del Uruguay (color: Stellar), on size 11's. This will go to my aunt Marcia in Alaska. 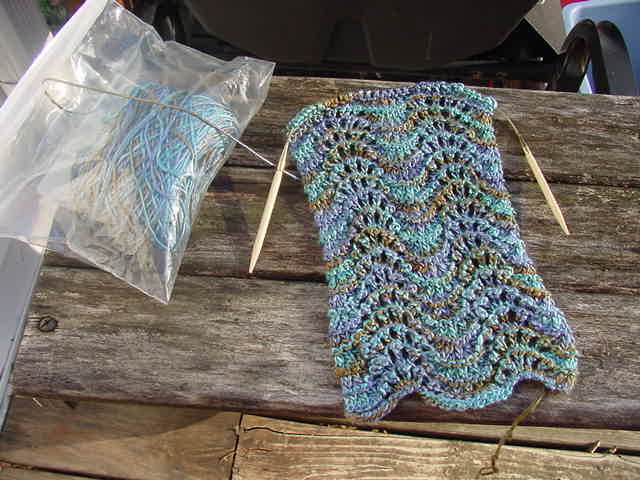 Next up is the start of my mom's scarf, Misty Gardens from ScarfStyle, which is actually just a feather & fan pattern. 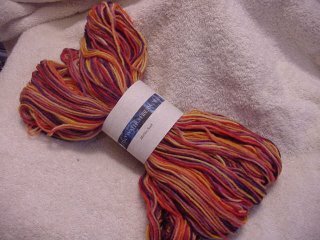 Yarn is Fiesta La Luz silk, size 7 needles. Finally we have the Diagonal Blanket, which I thought would be the death of me. It's not hard, but very tedious. Homespun yarn (color: Montana Sky, photo makes it look a little lighter than it actually is), on size 13 needles. This blanket will be sent to my Aunt Marcia, who will take it (and others) to Mexico to give to some of the Maya who lost what little they had in hurricane season. Went to JoAnn's (technically, JoAnn's, Etc.) this morning to get some Homespun and a new size I crochet hook. That's it. I came out with the required Homespun, 4 skeins of Caron Simply Soft worsted and new circular needles. Somehow, while inside the store, I managed to convince myself to make two totally new blankets for Project Linus - rather than finish the one that's about halfway finished and then make a second one. Oh no. Couldn't do things the easy way. 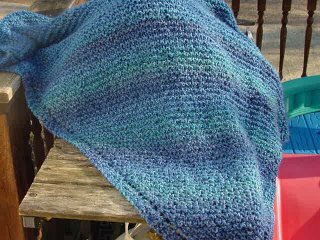 The Homespun is for a very cute, slightly funky baby-sized blanket. 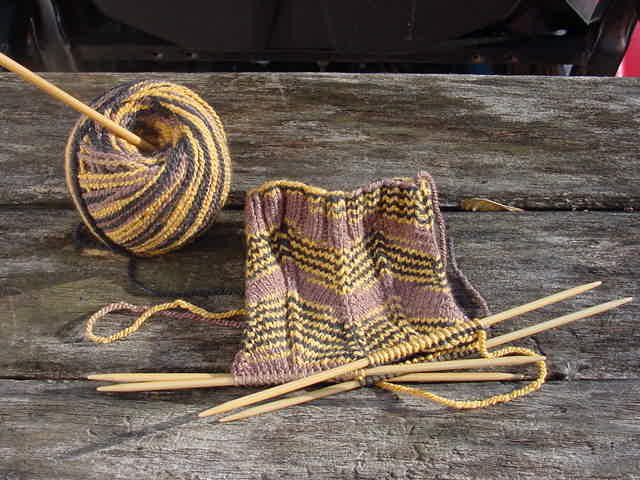 Four strands worked together on size 50 needles. Yes, folks, you read that right...SIZE 50. They are like telephone poles. I kid you not. 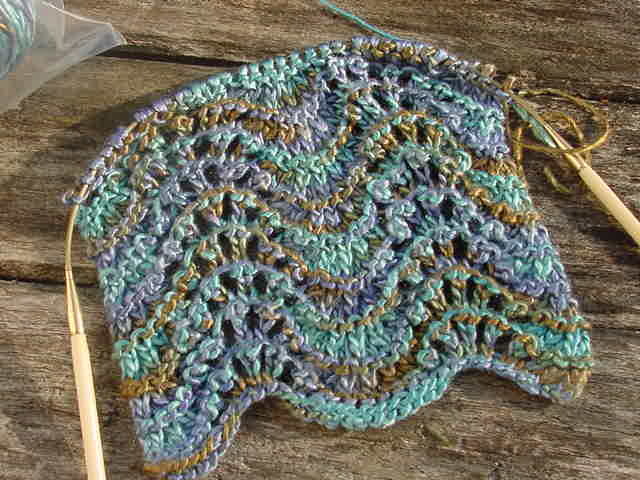 I'm hoping it will be cute when it's finished - right now I'm not convinced. I'm consoling myself with the very soft Simply Soft in a delicious "Blue Mint," which is actually turquoise. I can't believe it's 2006. Where does the time go? Really?? It's insane. We got back home on New Year's Eve night. We spent the entire week out of town, which wasn't really what we'd planned, but it was fine. Well, I say "planned," but I use that term very loosely. Persingers aren't known for planning. They are known for a very laid-back, "whatever" sort of mentality, which can be a good thing...but sometimes it sure would be nice to know in advance what we'll be doing. Anyway, I digress. We spent the first few days in Jefferson City, MO at Greg's parents' house. Christmas was nice and I know his parents were very happy that we came. My SIL and BIL are just odd and I have to remind myself of that, so I don't take things personally. It was nice to see everyone, but I was thrilled that Greg was agreeable to going to IL to spend some time with my family. As luck would have it, I was also able to go to an Illini basketball game while I was there, which totally made my holiday! (IL vs SE MO State...IL won, of course) It was so nice to see my family - I really hope the kids and I are able to go back in the spring. The kids were thrilled with their Christmas presents and now I need to do some serious pruning of the old toys. My big gift was an iPod, which I'm very excited about. Podcasts here I come! 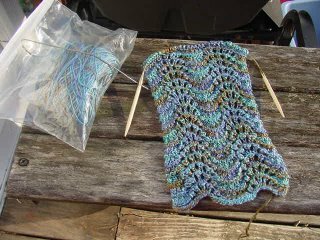 I did get a lot of knitting done over the holiday week. 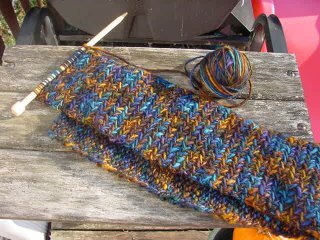 Finished my first Jaywalker (Cedric1), started the second, worked on My So-Called Scarf, my mom's silk scarf and started a new sock for my sister. Last night I finished the Diagonal Baby Blanket, which I'll never make again. 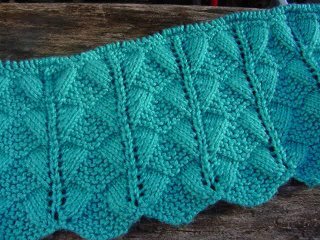 It's not hard, I just didn't enjoy knitting on the diagonal AT ALL. Pics to follow later, of course. I think that just about sums it up. I do plan to blog more often this year.